Great speaker for playing music, making announcements, even Karaoke! LEDs light up the speaker to move with the beat, or just to provide some mood lighting. Includes a wired microphone and stand- making this a perfect system for public speaking, or, plug in your favorite music playlist and sing along to your favorite tunes. 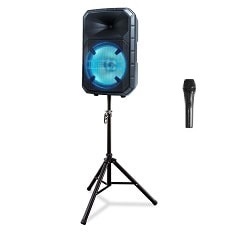 Includes: 500w speaker,Stand, Wired microphone and Aux cord.